In trying to come up with a name for this dish I reviewed the list of ingredients and the answer became obvious. I think you'll agree. Place the chicken and potatoes in an oven-proof casserole. Drizzle with olive oil and lemon juice. Sprinkle with rosemary, garlic, scallions, salt, and pepper. Marinate in the refrigerator for 30 to 60 minutes, turning occasionally. Bake covered in a preheated 400F (200C) oven for 30 minutes. Add the olives and mushrooms and bake an additional 30 minutes. Serves 4 to 6. Although I generally avoid using the term "comfort food" because it means something different to everyone, this dish epitomizes the term as far as I am concerned. Whether made by my mother or ordered in a roadside diner, it never fails to please. Combine the chicken pieces, carrots, and broth in a saucepan and bring to a boil over high heat. Simmer covered for 5 minutes, remove from heat and set aside. In a separate saucepan, melt the butter over moderate heat. Add the mushrooms, onion, salt, pepper, thyme, and flour and stir to thoroughly mix. Cook over moderate heat for 5 minutes, stirring frequently. Add the chicken broth mixture and stir until the sauce thickens. Add the cream and peas and stir for 2 minutes. Roll the pastry into 12 circles about 6 inches (15 cm) in diameter. Place half in the bottoms of six 5-inch pie pans and fill with the chicken mixture. Top with the remaining dough and pinch the edges together, trimming off the excess with a knife. Cut 2 or 3 slits in the top of each and bake in a preheated 425F (220C) oven for 35 minutes, or until the crust is golden brown. Serves 6. This is not an authentic Tahitian recipe, but it's still delicious. The name comes from the use of tropical fruits which are now available year-round almost everywhere. Please use fresh pineapple for the best results-and if you're feeling fancy, serve the chicken in scooped-out pineapple shells. Brown the chicken pieces in the butter in a skillet over high heat. Transfer the chicken to a baking dish and bake in a preheated 350F oven for 30-40 minutes. Meanwhile, combine the orange juice, lemon juice, brown sugar, soy sauce, and cornstarch in a saucepan and bring to a boil over moderate heat, stirring constantly. Add the fruits and pour over the chicken for the last 10 minutes of cooking. Serves 4 to 6. My imaginary girlfriend developed a fondness for this dish while backpacking through India and Southeast Asia during her college years. She tells me that it is traditionally served on a bed of raw onions sliced paper thin, but she prefers to serve it by itself, or sometimes on a bed of rice pilaf. I asked her if she knew the meaning of tikka and she replied says it means "cutlet." Cut each chicken breast crosswise into 3 pieces and place in a mixing bowl. Combine the remaining ingredients in an electric blender or food processor and process until smooth. Pour over the chicken and toss to coat thoroughly. Let stand at room temperature for 1 to 2 hours. Saute the chicken pieces in small batches in a heavy skillet over high heat until golden brown on all sides, about 10 minutes, adding more marinade to the skillet to prevent sticking if necessary. Serve immediately. Serves 4 to 6. Some recipes-maybe most-are all about ingredients. This one is all about technique. The weight of the bricks on the chicken during cooking forces it to a uniform thickness to aid in even cooking; the skin is pressed flat against the cooking surface for even browning; and much of the fat is squeezed out during cooking. This is truly one of the world's great chicken recipes. Using a sharp knife or pair of poultry shears, remove and discard the backbone from the chicken. Lay the chicken on a flat surface, skin side up, and flatten the breast by pressing with the heel of your hand-the chicken should be as flat as possible. Rub with lemon juice and season generously with salt and pepper. Heat the oil in a large, heavy skillet over medium-high heat until it is hot but not smoking. Place the chicken in the oil skin side down and place a lid or other skillet on top of the chicken. Place two bricks or other weights totaling about 10 pounds (4.5 Kg) on top of the lid and cook the chicken over medium-high heat until the skin is golden brown, about 12 minutes. Remove the weights and lid and turn the chicken over. Replace the lid and weights and cook 12 minutes more. To test for doneness, pierce the thigh with the tip of a sharp knife-the juices should run clear. Transfer the chicken to a serving platter and cover with aluminum foil. Let rest for 10 to 30 minutes before cutting into serving pieces. Serves 4 to 6. French chefs have a fetish about not browning garlic, but those of us who have ignored this mandate, whether intentionally or by accident, know that browned garlic takes on a lovely, slightly bitter quality that is quite appealing. Heat the oil in a large skillet over moderate heat and cook the sliced garlic and chili flakes, stirring frequently, until the garlic is dark brown, about 10 minutes. Be careful not to cook the garlic until it begins to turn black. Add the tomatoes, salt, and pepper and simmer uncovered until the sauce is fairly thick, about 10 minutes. Add the chicken thighs and cook covered, stirring occasionally, until the chicken is cooked, about 15 minutes. Garnish with the parsley and serve immediately. Serves 4 to 6. This simple dish has all the complex flavors of North Africa. Combine all ingredients except the parsley in a pot and bring to a boil over high heat. Reduce the heat and simmer covered until the chicken is cooked through, about 30 minutes. Serve garnished with chopped parsley. Serves 4 to 6. This is a reduced fat version of a classic French dish. Please don't be intimidated by the amount of garlic in this recipe, since it becomes mellow and sweet with cooking. Spread the garlic on bread or toast for a special treat, or do as I do and eat the cloves whole (minus the peel, of course) along with the chicken. Place the cloves of garlic in a saucepan with enough water to cover. Bring to a boil and simmer uncovered for 10 minutes. Drain and set aside. Heat the olive oil in a large pot over high heat. Brown the chicken pieces on all sides. Add the wine or chicken stock, thyme, salt, pepper, and reserved garlic. Bring to a boil and simmer covered for 40 to 45 minutes. Remove the chicken and garlic to a serving platter. Measure the liquid remaining in the pan, and add more if necessary to make 1 cup (250 ml). Return the liquid to the pot and bring to a boil. Mix a little of the liquid with the flour to form a slurry, and add to the liquid. Cook 3 to 5 minutes, stirring constantly, until the sauce has thickened. Spoon over the chicken pieces and serve immediately. Serves 4 to 6. Boneless, skinless chicken breasts are the ideal meat for this week's "15-Minute Dishes" theme because they will cook in under 10 minutes using the following method. Hold the chicken breast halves firmly on a cutting board with the palm of your hand. Using a sharp knife, carefully cut the chicken breasts in half horizontally, sliding the knife blade between your hand and the cutting board. Place a sage leaf on each piece of chicken, and wrap with a slice of prosciutto, securing with a toothpick if necessary. Heat the oil in a skillet over moderate heat and saute each piece of chicken for 2 to 3 minutes on each side. Add the vermouth and cook covered for 3 minutes. Remove the chicken from the skillet and add the cream, salt, and pepper. Bring the sauce to a boil and pour over the chicken. Serves 4. I may be in the minority here, but I love chicken livers no matter how they're cooked. This traditional Chinese preparation is no exception. Drop the snow peas into boiling salted water and cook for 30 seconds. Drain and rinse-they should be bright green-and set aside. Combine the chicken livers, soy sauce, rice wine, cornstarch, and sugar in a small bowl and toss to combine thoroughly. Heat the oil in a wok or large heavy skillet over high heat. Add the ginger and scallions and stir-fry for 30 seconds. Add the chicken livers and stir-fry until they are firm and brown, 4 to 5 minutes. Add the snow peas and stir-fry just until they are heated through, about 1 minute. Adjust the seasoning with salt and pepper. Serves 4 to 6. You can use one of the commercially prepared Chinese five-spice powders in this dish if you like, but the mixture of spices in this recipe will give the dish a brighter, more distinctive flavor. Place the chicken pieces in a large dish or plastic bag. Mix the remaining ingredients and pour over the chicken. Marinate refrigerated for 1 to 2 hours. Transfer the chicken to a baking dish and brush with the marinade. Cook uncovered in a preheated 350F (180C) oven, brushing once or twice with the marinade, until the chicken is done, about 1 hour. Serves 4 to 6. Get out the little umbrellas and pull up the lounge chairs because this delicious dish has "tropical" written all over it. Season the chicken fillets with salt and pepper and dip in the milk. Dredge very lightly with the flour, dip into the beaten egg, and coat with the coconut. Heat the butter in a large heavy skillet over moderate heat and saute the chicken until golden brown, 4 to 5 minutes per side. Combine the ingredients for the salsa in a mixing bowl and toss gently to combine. Serve the chicken on a bed of the salsa, or spoon the salsa over the chicken. Serves 4 to 6. What little cooking there is to be done in this recipe can be done in advance, allowing busy cooks to catch up on their naps. *You may substitute spinach, basil, parsley, arugula, sorrel, or any combination of these. Combine the onion, garlic, and the rosemary in a saucepan along with enough water to cover the chicken breasts, and bring to a boil. Simmer over low heat for 5 minutes, then add the chicken breasts. Simmer for 5 minutes, then remove from the heat. Allow to sit in the poaching liquid for 10 minutes, then place the pan in the refrigerator, complete with the poaching liquid. Allow to chill for 2 to 3 hours. For the sauce, combine the watercress, mayonnaise, sour cream, shallot, salt, and pepper in a food processor or electric blender and puree until smooth. To serve, remove the breasts from the poaching liquid and drain on paper towels. Place a dollop of the sauce on top of each breast, and put the rest of the sauce in a bowl for diners to serve themselves. Serves 4 to 6. Legend has it that this dish was brought to Savannah, Georgia by a sea captain who had run across it in his travels to the East Indies. It has since become a Southern classic, and was one of FDR's favorite dishes. Season the chicken generously with salt and pepper. Heat the oil in a large, heavy pot (Dutch oven) over high heat and, working in batches, brown the chicken pieces on all sides. Remove to a plate and set aside. Add the onions, bell pepper, and garlic and saute for 5 minutes. Add the flour, paprika, curry powder, and cayenne and saute for 1 minute, stirring constantly. Add the chicken stock, scraping the bottom of the pot to dissolve the brown bits. Bring to a boil, reduce the heat, and simmer covered for 10 minutes. Add the tomatoes, raisins, bay leaf, and optional mango. Remove and discard the skin of the chicken and add the chicken and the accumulated juices to the pot, making sure it is submerged in the liquid. Simmer tightly covered until the chicken is done, about 30 minutes. Adjust seasoning with salt and pepper and serve garnished as desired. Serves 4 to 6. I know it isn't exactly considered haute cuisine, but nothing makes a crispier, crunchier coating than crushed potato chips. Pound the chicken breasts a little to flatten them and make them uniform in thickness. Cut in half horizontally and set aside. Combine the mayonnaise, chili powder, lemon zest, salt, and pepper in a bowl, stirring to combine thoroughly. Place the crushed potato chips on a plate. Add the chicken cutlets to the mayonnaise mixture, tossing them to coat evenly, and press into the potato chips to coat both sides. Heat the oil in a large heavy skillet over moderate heat and saute the cutlets in batches until browned on both sides and cooked through, about 5 minutes. Transfer to a baking sheet and keep warm in a low oven while the remaining cutlets are cooking. Serves 4 to 6. In spite of the overnight marinating for this dish, it is still quick to assemble and easy to cook. Combine all ingredients in a large, nonreactive bowl and toss to thoroughly combine the ingredients and coat the chicken breasts with the mixture. Marinate overnight in the refrigerator. Broil or grill until cooked through. Serves 4 to 6. The au blanc part of this recipe's title refers to the fact that the chicken is not browned, leaving it and the sauce a lovely pale white in color. Please don't try to use dried tarragon in this recipe; it really deserves the incomparable flavor and aroma of the fresh herb. Place the onion, carrot, celery, tarragon sprigs, and optional white wine in a large pot. Place the chicken breasts on top of the vegetables and add enough water to cover. Bring to a boil over high heat, reduce the heat and simmer covered until the chicken is done, about 20 minutes. Meanwhile, boil the rice in an ample amount of salted water until tender, about 20 minutes. Drain and stir in the butter, salt, pepper, and paprika. Arrange the rice on a serving platter and place the drained chicken breasts on top. Strain the cooking liquid to make the sauce. For the sauce: Heat the butter in a saucepan over moderate heat and stir in the flour and cayenne. Cook for 3 minutes, stirring frequently. Add the cooking liquid and bring to a boil, stirring frequently. Stir in the cream and tarragon and adjust the seasoning with salt and pepper. Simmer for 3 minutes. Spoon over the chicken and serve immediately. Serves 4 to 6. A review of the Greek recipes I have published over the years would reveal that I am inordinately fond of egg-lemon sauce. It is paired with chicken and parsley in this unusual dish in which the parsley is treated more like a vegetable than as a garnish. Heat half the oil in a skillet over moderate heat and brown the chicken pieces on all sides. Add the wine and cook for 5 minutes. Add the salt, pepper, and chicken stock and simmer covered over low heat for 30 minutes. Cut off and discard most of the stems of the parsley. Heat the remaining oil in a separate skillet over moderate heat and saute the parsley and scallions until wilted, about 3 minutes. Add to the chicken mixture and cook 10 to 15 minutes more. Place the chicken pieces on a serving platter or individual plates and arrange the parsley mixture around the chicken. Spoon the avgolemono sauce over the chicken and garnish with chopped fresh parsley. Serves 4 to 6. Whisk together the eggs, lemon juice, and cornstarch mixture. Combine with the remaining ingredients in a saucepan and bring to a simmer over low heat, stirring frequently, until the sauce is hot and slightly thickened. Do not boil. Makes about 2 cups (500 ml). It really takes only two ingredients to conjure up the flavors of Greece: lemon and oregano. This simple method of cooking chicken is as old as the hills and can be used with fish and shellfish as well. Combine the butter and olive oil in a small pot and heat gently until the butter is melted. Place half the mixture in a roasting pan. Season the chicken pieces with the oregano, salt, and pepper, and place in the pan. Combine the lemon juice with the remaining butter mixture and baste the chicken with it. Bake the chicken in a 375F (190C) oven, basting several times, until the skin is crispy and the chicken is cooked through, 30 to 40 minutes. Transfer the chicken to a platter and add the boiling water to the roasting pan, scraping the bottom to dissolve the brown bits. Transfer the liquid to a small pot over moderate heat and stir in the cornstarch mixture. Add any remaining basting liquid and bring to a boil, stirring constantly. Adjust the seasoning with salt and pepper and serve the gravy along with the chicken. Serves 4 to 6. The classic French dish gets updated for the modern backyard chef. Combine the cheese, ham, salt, and pepper in a small mixing bowl. Place each chicken breast half in between two layers of plastic wrap and pound, using a meat mallet or the bottom of a small heavy pan, until the meat is about 1/4 inch (5 mm) thick. Divide the cheese mixture between the flattened breast halves and fold them in half to cover the filling. Skewer the sides shut with toothpicks, brush both sides with melted butter, and season with salt and pepper. Grill directly over hot coals for 4 to 5 minutes per side, until the meat juices run clear and the cheese is melted. Carefully remove the toothpicks before serving. Serves 4 to 6. If you are planning on grilling at your picnic then you can take these along in the marinade. Otherwise, cook them ahead and transport them chilled. Either way, they are tasty and nutritious. * Available in the spice section of most supermarkets and in Asian specialty shops. Place the chicken breasts in a shallow glass pan. Stir together the remaining ingredients except for the tortillas and pour over the chicken. Marinate refrigerated for 30 minutes to several hours. Grill or broil the chicken breasts until done, about 3 minutes per side. Serve immediately wrapped in a tortilla or pita bread, or transport chilled and wrap immediately before serving. Serves 8. This quick main dish couldn't be much easier, and offers some variety for the summer backyard grill. Combine all ingredients except the chicken pieces in a large bowl and stir to combine. Add the chicken pieces and toss to coat. Marinate overnight, turning the pieces occasionally. Grill or broil the chicken until done, basting frequently with the marinade. Serves 4 to 6. This method of roasting requires a little more attention than others due to the frequent basting, but the result is a crisp skin that makes it well worth the extra effort. Season the inside of the chicken with salt and pepper. Place the garlic, herbs, and lemon wedges in the cavity. Truss the chicken and place in a lightly greased roasting pan. Drizzle with the olive oil and rub it into the skin of the chicken. Place the pan in the center of a preheated 425F (220C) oven. Baste with the accumulated pan juices every 10 to 15 minutes until the chicken is done, about 80 to 90 minutes. The chicken is done when the juices run clear when the thickest part of the thigh is pricked with a knife. Remove the chicken from the oven and allow to rest 10 minutes before carving. Serves 4 to 6. I haven't published quantities for the ingredients in this recipe because I do it by eye. It may be the easiest chicken recipe you have ever cooked, and your family will love it. If you dream up an exotic name for it such as "Poulet a la Reinne de la Maison," you may be able to convince them you slaved all day over a hot stove. Remove the skin from the chicken pieces if you want to reduce fat. Season with salt and pepper, and place in a baking pan. A layer of aluminum foil underneath will make clean-up easier. Drizzle with honey and sprinkle a liberal amount of sesame seeds on each piece. Bake in a 325F (160C) oven for 30 minutes, or until cooked through. This classic Hungarian stew makes its own liquid as it cooks. Be sure to use sweet Hungarian paprika for the best flavor and color. You might consider serving this dish with egg noodles or mashed potatoes. Season the chicken thighs liberally with salt and pepper. Heat the oil in a large pot and, working in batches, lightly brown the chicken thighs on all sides. Remove the chicken to a plate and saute the onions in the same pot until tender but not browned, about 5 minutes. Add the peppers and saute another 5 minutes. Add the paprika and flour and stir until the paprika becomes fragrant, about 1 minute. Add the wine and stir to scrape up the brown bits in the bottom of the pan. Stir in the tomatoes and return the chicken thighs and the accumulated juices to the pan, nestling them under the vegetables. Simmer tightly covered over low heat or bake in a 300F (150C) oven until the chicken is cooked through, about 30 minutes. Remove the pot from the heat and transfer the chicken thighs to a serving platter. Place the sour cream in a small bowl and stir into it some of the liquid in the pot. Add the sour cream mixture to the pot and stir to mix well. Spoon the sauce over the chicken and garnish with chopped parsley. Serves 4 to 6. This dish is representative of the many masalas, or spice mixtures that characterize Indian cooking. Combine all the ingredients for the masala in an electric blender and process until a moist paste is formed. Heat the oil in a large skillet over moderate heat and add the masala and cinnamon stick. Cook, stirring frequently, for 6 to 8 minutes. Add the chicken pieces and stir until they are coated. Add the lemon juice, chicken broth, and peppercorns and bring to a boil. Reduce the heat and simmer covered for 15 minutes. Remove the lid and let the sauce reduce for about 5 minutes. Remove and discard the cinnamon stick before serving. Serve with rice, garnished with chopped cilantro. Serves 4 to 6. Northern India was invaded by the Moghuls in the sixteenth century. These people of Turkish/Mongol extraction introduced new foods and cooking techniques from other lands they had conquered, especially Persia, and Moghul cooking became known as the highest and most refined style of Indian cooking. To this day, this is the style of food served in most fine Indian restaurants in India and around the world. Here is a dish using the almonds that the Moghuls introduced to the subcontinent. Heat about 2 tablespoons (30 ml) of the oil in a large, heavy pan over moderate heat and add the chicken pieces. Cook, turning frequently, just until they lose their pink color-do not brown them because this will darken the sauce. Transfer the chicken pieces to a platter and heat the remaining oil in the pan. Saute the onions until they are tender but not browned, about 10 minutes. Add the almonds, coriander, and cardamom and cook until they become aromatic and slightly browned, about 3 minutes. Remove from the heat and stir in 1 cup (250 ml) water and the cayenne pepper. Puree the mixture in batches in an electric blender or food processor and return it to the pot. Add the chicken pieces, yogurt, and salt and bring to a boil. Reduce the heat and simmer covered until the chicken is tender and the sauce has thickened, about 40 minutes. The oil should have separated from the sauce to form a glaze over the sauce and chicken. This glaze is prized in India and is a trademark of opulent cooking. Remove the dish from the heat and let rest for at least 30 minutes, or refrigerate for up to 2 days (this dish improves with time) before serving. Reheat by simmering over moderate heat until the chicken is piping hot. Serves 4 to 6. This is one of those rare occasions when I would rather use butter than olive oil in order to let the bright, fresh flavor of the lemon dominate the dish. Trim the chicken breasts of any excess fat and slice in half horizontally. Season the chicken with salt and pepper and dust lightly with flour. Heat the butter in a large skillet over moderate heat and saute the chicken a few pieces at a time (don't crowd the skillet) until golden brown on both sides and firm to the touch, about 2 minutes per side. Transfer the cooked chicken to a platter while you cook the remaining pieces. After cooking the chicken add the remaining ingredients to the skillet and cook until the sauce is slightly thickened. Transfer the chicken to the skillet and turn them in the sauce to coat both sides. Serves 4 to 6. Here is a classic Italian dish that gets its name from the hot red peppers. In reality it is only mildly spicy, so don't skimp on the seasonings. Combine the butter, oil, and red pepper flakes in a small bowl. In a separate bowl mix together the garlic, onion, parsley, and 4 teaspoons (20 ml) of the butter mixture to form a coarse paste. Brush the chicken quarters with some of the remaining butter mixture, sprinkle with salt, and broil, skin side down, under a preheated broiler for 5 minutes. Baste again and continue broiling for 5 more minutes. Turn the chicken skin side up and baste again. Broil another 10 to 15 minutes, basting every 5 minutes, until the juices run clear when a thigh is pierced with the tip of a knife. Spread the onion mixture over the chicken using a metal spatula to pat it firmly into place and continue broiling until the coating is lightly browned, 3 to 4 minutes. Transfer the chicken to a platter or individual serving plates and spoon the pan drippings over it. Serve garnished with lemon wedges. Serves 4 to 6. In Jamaica this seasoning mixture is used to flavor chicken, pork, fish, and shellfish, and is often added to soups and stews. If you like spicy food, you'll probably want to put it on just about everything too. Combine the ingredients for the jerk seasoning in an electric blender or food processor and process until smooth. Rub the mixture over the chicken pieces and refrigerate covered for 12 hours or overnight. Grill skin side up over indirect heat until the juices run clear, 30 to 40 minutes. Turn and place the pieces skin side down directly over hot coals for 5 minutes to crisp the skin. Serves 4 to 6. Rub the chicken pieces with 1 tablespoon (15 ml) of the soy sauce and set aside. Combine the remaining tablespoon of soy sauce, lemon zest, lemon juice, water, and sugar in a small bowl, stirring to dissolve the sugar. Heat the sesame oil in a wok or large, heavy skillet over high heat. Brown the chicken pieces on all sides. Add the ginger and cook for 1 minutes. Add the lemon mixture and bring to a boil. Reduce the heat to very low and simmer the chicken covered for 20 minutes. Remove the chicken to a warm platter and add the cornflour mixture to the pan. Stir the mixture until it boils and has thickened. Spoon over the chicken pieces and garnish with lemon slices and chopped scallions. Serves 4 to 6. This green version is just one example of the many moles of Mexican cuisine. A mole (from the Nahuatl word molli for sauce) doesn't necessarily include chocolate as some food pundits would have us believe, but some sort of chili pepper is always among the ingredients. * Also called pepitas, pumpkin seeds are available in many supermarkets and Hispanic specialty shops. Combine the chicken pieces and stock in a pot and bring to a boil over high heat. Reduce the heat and simmer covered for 45 minutes. Drain the chicken and keep it warm, reserving the stock. Using a fork, hold the poblano chiles over a gas flame or electric burner until the skin is blistered and blackened in places. Place in a paper bag and allow to rest for 20 minutes. Peel the peppers, slit them lengthwise, and remove the seeds and veins. Working in small batches, pulverize the pumpkin seeds in an electric blender or food processor. Combine the poblano chiles, ground pumpkin seeds, walnuts, almonds, onion, garlic, tomatillos, coriander, salt, and pepper in a bowl and mix to combine. Working in batches, puree the mixture in an electric blender or food processor, adding enough of the reserved chicken stock to make a thick paste. Heat the oil in a large skillet over high heat and add the sauce. Cook, stirring constantly, for 3 to 4 minutes. Thin to the consistency of heavy cream with the chicken stock if necessary. Reduce the heat to very low, transfer the chicken to the skillet, and simmer covered until the chicken is very tender, 15 to 20 minutes. Serves 4 to 6. Pipián is difficult to translate. My Spanish-English dictionary says simply "fricassee," and the dictionary of the Spanish Royal Academy defines it as a New World stew made with meat, chicken, turkey, or other fowl with salt pork and almonds. The Spanish Academy not withstanding, some versions are based around seafood, and vegetarian versions can also be found. Combine the chicken, stock, scallions, cilantro, and carrot in a large pot and bring to a boil over high heat. Reduce the heat and simmer covered for 45 minutes. Remove the chicken pieces, strain and reserve the stock, and return the chicken pieces to the pot. Puree the soaked ancho chilies along with a little of the soaking liquid in an electric blender or food processor. Heat the oil in a skillet over moderate heat and saute the chili mixture and pulverized almonds for 5 minutes, stirring frequently. Add about 2 cups (500 ml) of the reserved chicken stock to make a medium-thick sauce. Stir in the seasonings and pour the sauce over the chicken. Cook over moderate heat for 10 minutes, or until the chicken is heated through. Serves 4 to 6. The spicy rub used in this recipe can also be applied to pork, lamb, and seafood. Combine the shallots, garlic, parsley, cilantro, paprika, cumin, salt, pepper, and optional cayenne in an electric blender or food processor and process until a smooth paste is formed. Rub the paste on the chicken and refrigerate for 1 to 2 hours. Place the chicken in a roasting pan and place the lemon wedges among the pieces (or in the cavity if using a whole chicken), squeezing a little lemon juice over the chicken. Bake in a preheated 400F (200C) oven (or grill over hot coals) until the juices run clear when the thickest part of the thigh is pierced, about 1 hour (2 hours if using a whole chicken). Remove from the oven and let stand for 10 minutes before serving. Serves 4 to 6. This dish, although not entirely authentic, has all the flavors of a Moroccan tagine. Serve it with couscous or brown rice for more North African flavors. Combine all the ingredients except the chicken thighs and cilantro in a heavy pot or slow cooker, stirring to combine. Place the chicken thighs on top. Cover tightly and bake in a preheated 300F (150C) oven, or simmer over a very low flame on the stove top, or cook in the slow cooker set on high, for 2 to 3 hours. Garnish with chopped cilantro. Serves 4 to 6. The Southern United States has a worldwide reputation for its many variations on fried chicken, and here is one version that might not be so universally known. The traditional process of frying chicken in deep fat a few pieces at a time can be laborious and time-consuming, so this simplified method is often used when large quantities of chicken are needed for a church dinner or family reunion. Season the chicken generously with paprika, salt, and pepper. Place in a single layer on a baking sheet or shallow baking pan. Brush with half the melted butter and cover tightly with aluminum foil. Bake in a preheated 400F (200C) oven for 20 minutes. Remove the foil, raise the oven temperature to 450F (230C) and bake an additional 20 minutes. Turn the chicken over, brush with the remaining butter, and bake uncovered for 20 minutes more. Serve hot, chilled, or at room temperature. Serves 4 to 6. Unlike other parts of the country where chicken pot pie is served with a crisp pastry topping, the Pennsylvania Dutch prefer to cook the pie dough in the broth. Mix together the dough ingredients, adding just enough water to form a stiff dough. Roll into a thin sheet on a floured surface and cut into 2-inch (5 cm) squares. Let dry for at least 1 hour. Combine the chicken and water in a large pot and bring to a boil over high heat. Reduce the heat and simmer covered until the chicken is tender, 20 to 30 minutes. Remove the chicken from the pot and skim any foam off the surface of the broth. Remove the meat from the chicken bones, discarding the bones and skin. Add the vegetables, salt, pepper, and saffron to the broth and simmer 10 minutes. Add the squares of dough to the broth and simmer 30 minutes, stirring occasionally. Add the chicken meat and heat through. Serve immediately garnished with chopped parsley. Serves 8 to 12. This light version of the classic hollandaise sauce calls for liquid egg substitute. If this is unavailable in your area then you will have to use real eggs, but you can still maintain a low-fat profile by using just a small dab of the sauce on your chicken. Combine the scallions, tarragon, lemon juice, and water in a skillet large enough to hold the chicken breasts in a single layer. Season the chicken with salt and pepper. Bring the water to a boil and add the chicken breasts. Add enough water to barely cover the chicken and return to the boil. Immediately reduce the heat to a simmer and cook covered for 15 to 20 minutes, until the chicken is firm to the touch. Remove the chicken breasts with a slotted spoon and spoon the hollandaise over each portion. Reserve the poaching liquid to make the hollandaise. Serve the remaining hollandaise on the side for diners to help themselves. Serves 4 to 6. Combine the lemon juice and the reserved poaching liquid in a small saucepan and boil until it is reduced to about 1/2 cup (125 ml). Meanwhile, beat the egg substitute in a heavy-bottomed saucepan over low heat. Slowly add the hot broth mixture, beating constantly, until the egg substitute thickens, about 3 minutes. Be careful not to overheat and curdle the egg mixture. When the sauce is the consistency of melted ice cream, whisk in the butter, mustard, and salt and pepper. This produces a thin hollandaise which will thicken slightly as it cools. Makes about 1 cup (250 ml). This is a classic Portuguese dish, popular wherever Portuguese people are to be found. The name comes from the chiles and traditional spice mixture of Angola, a former Portuguese colony. Prepared piri-piri sauce is available in some gourmet shops and on the internet, but you can substitute any hot sauce that you have on hand. Heat the oil in a large skillet over moderate heat. Season the chicken generously with salt and pepper and brown on all sides. Add the onion and saute for about 3 minutes. Add the remaining vegetables and saute until tender but not brown, about 5 minutes. Add the stock, tomatoes, tomato paste, cinnamon stick, bay leaves, thyme, and piri-piri sauce and bring to a boil. Ladle about 1 1/2 cups (375 ml) of the cooking liquid into a small pot and set aside. Place the rice in the bottom of a large baking dish. Transfer the chicken and vegetables to the baking dish and add the liquid from the skillet. Bake tightly covered in a preheated 350F (180C) oven until the rice is cooked, about 30 minutes. Meanwhile, heat the reserved liquid and add the lime juice and additional piri-piri sauce to taste. Serve the chicken and vegetables on top of the rice, and serve the additional sauce separately. Serves 4 to 6. This may not be the official national dish or Portugal, but it could be. Fragrant with the sweet aroma of Portugal's best wines, it's a dish you won't soon forget. Season the chicken with salt and pepper. Heat the oil and butter in a large heavy baking dish over moderate heat and brown the chicken on all sides. Transfer the chicken to a plate and set aside. Saute the onions in the same baking dish until tender but not brown, about 10 minutes. Stir in the stock, wine, and oregano and return the chicken to the skillet. Cover and simmer over low heat until the chicken is tender, 45 to 60 minutes. Adjust the seasoning with salt and pepper and add the peas about 15 minutes before serving. Serves 4 to 6. This technique can also be used with fish fillets and shrimp or scallops, and the sauce can also be used to top rice, noodles, or potatoes. Season the chicken breasts with salt and pepper and coat lightly with flour. Heat the olive oil in a skillet over moderate heat and saute the chicken breasts until golden brown on both sides and firm to the touch. Transfer the chicken to an oven-proof platter and keep warm in a 200F (90C) oven. Add the wine and chicken stock to the skillet and reduce it by half, being sure to scrape up all the brown bits in the skillet as you stir. Stir in the fresh herbs and the optional capers and butter, and adjust the seasoning with salt and pepper. Spoon the sauce over the chicken and serve immediately. Serves 4 to 6. This classic French dish is easier to make than one might think. Heat the butter and oil in a large heavy pot over high heat and brown the chicken pieces on all sides. Remove the chicken to a plate and, in the same pot, cook the onions until lightly browned, 10 to 15 minutes. Season the chicken with salt and pepper and return it to the pot. Add the garlic, bay leaf, thyme, tomato, wine, and chicken stock and bring to a boil. Reduce the heat and simmer tightly covered until the chicken is cooked through, about 20 minutes. Transfer the chicken pieces to a serving platter. Skim off and discard as much fat as possible from the liquid in the pot. Stir the flour mixture into the liquid, stirring to thicken it slightly. Spoon the sauce over the chicken and garnish with chopped parsley. Serves 4 to 6. You'll enjoy the unusual combination of flavors in this dish. Press the chicken breasts with the palm of your hand to flatten them slightly. Heat the butter in a large skillet over moderate heat and saute the chicken breasts until they are lightly colored on both sides, about 3 minutes per side. Remove from the skillet and set aside. Add the onion to the skillet and saute it until tender, about 10 minutes. Add the vinegar and boil gently until the mixture has reduced to a syrupy consistency. Whisk in the chicken stock, cream, tomato paste, salt, and pepper. Return the chicken breasts to the skillet and simmer them in the sauce, basting occasionally, until the chicken is just done and the sauce has thickened, about 5 minutes. Transfer the chicken to a serving platter and add the optional fresh raspberries to the skillet. Heat for 1 minute and spoon the sauce over the chicken. Serves 4 to 6. Here is a hearty and tasty dish with an unusual sweet and sour sauce. Heat the butter in a large skillet over moderate heat and brown the chicken pieces on all sides. Remove the chicken pieces and saute the carrots, celery, and onion in the same skillet for 5 minutes. Add the chicken pieces, chicken stock, bay leaves, salt, and pepper. Reduce the heat and simmer covered for 45 minutes, turning the chicken pieces and stirring the liquid occasionally. Add more chicken stock if necessary; there should be a little liquid in the bottom of the skillet at all times. Add the prunes and simmer covered for 5 minutes. Meanwhile prepare the sauce. Melt the butter in a small saucepan over moderate heat. Stir in the flour and cook for 2 minutes. Stir in the chicken stock, lemon juice, and sugar. Bring to a boil, stirring constantly. Remove the chicken pieces and prunes to a warm serving platter. Remove and discard the bay leaves. Pour the sauce into the skillet and stir to scrape up the brown bits on the bottom of the pan. Pour the sauce over the chicken, or serve it in a gravy boat. Serves 6 to 8. This recipe calls for baking the chicken, but you might try it for your next backyard cookout. Combine all the ingredients except the sesame seeds in a large bowl and toss to coat the chicken thoroughly. Refrigerate covered for at least 4 hours or overnight. Place the chicken and marinade in a baking dish and bake in a preheated 400F (200C) oven for 35 to 45 minutes, until done. Sprinkle with sesame seeds immediately before serving. Serves 4 to 6. 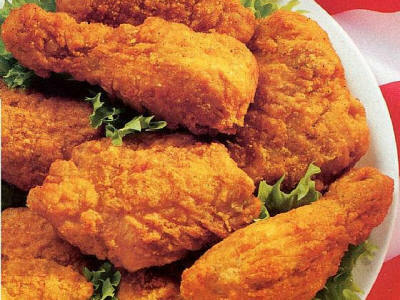 There are as many recipes for fried chicken as there are cooks in the South. Some insist the chicken be marinated in buttermilk prior to coating. Others have a secret blend of seasonings that makes their chicken stand out. My recipe is basic, and should be "do-able" almost anywhere you live. You may substitute vegetable shortening or vegetable oil for the lard, but you won't get an authentic flavor or texture, and if you are on a fat-restricted diet you had best skip this recipe. Pat the chicken pieces completely dry with paper towels and sprinkle on all sides with 2 tsp. of the salt and a few grindings of black pepper. Dip the chicken pieces in the 1 cup of flour, one at a time, and shake off all the excess. Melt 1 1/2 lbs (700 g) of the lard in a large, heavy skillet at least 2 in (5 cm) deep with a tightly fitting lid. The melted lard should be about 1/2 in (1.25 cm) deep; add more lard if necessary. When the lard is very hot but not smoking place the chicken pieces in the lard, skin side down, and cover. Fry over high heat for 5 minutes. Turn the pieces of chicken with tongs and continue to fry covered for an additional 4 to 5 minutes, until the chicken is evenly browned on both sides. Remove the chicken to a large shallow baking dish which is lined with paper towels and place in an oven set at the lowest setting to keep warm. Pour off all but 1 Tbs of the fat remaining in the skillet and add the onions. Sprinkle with 2 Tbs flour and cook over high heat for 3 or 4 minutes, stirring frequently, until the onions are soft and golden brown. While stirring constantly, add the water in a thin stream and cook until the gravy thickens and becomes smooth. Stir in the vinegar and the remaining 1/2 tsp. of the salt and a few grindings of black pepper. Arrange the chicken on a serving platter and pour the gravy over. Or, more traditionally, put the cooked white rice in a serving bowl, pour the gravy over it, and serve it as an accompaniment to the chicken. Serves 4. Most of us are familiar with the famous "mole poblano," the thick sauce from Mexico that contains chocolate among its many ingredients. Here is a dish along similar lines from the Spanish-speaking country on the other side of the Atlantic. Season the chicken generously with salt and pepper. Heat the oil in a large skillet and add the chicken, garlic, onion, and cinnamon stick. Cook the chicken slowly, covered over low heat, until browned on all sides. Meanwhile, combine the wine, almonds, chocolate, lemon zest, and saffron in a food processor or electric blender and process to form a paste. Add the chocolate mixture to the skillet and simmer covered until the chicken is very tender, about 45 minutes. Discard the cinnamon stick before serving. Serves 4 to 6. The Moors introduced almonds to Spain where they show up in sweet and savory preparations of all kinds. This dish has been cited as one of the ancestors of the famous mole poblano of Mexico. Season the chicken generously with salt and pepper and dredge lightly with flour. Heat the lard in a large skillet and brown the chicken pieces on all sides. Transfer the chicken to a large casserole. In the same skillet, saute the almonds, garlic, and bread until golden brown. Transfer to a small bowl and saute the onion in the remaining fat until lightly browned. Combine the almonds, garlic, bread, parsley, cinnamon, nutmeg, cloves, peppercorns, saffron, and sherry in an electric blender or food processor and process until smooth. Stir the almond mixture into the onions and pour over the chicken pieces. Add the chicken stock and bay leaf and bring to a simmer over moderate heat. Reduce the heat and simmer tightly covered until the chicken is tender, about 1 hour. Remove from the heat and stir a little of the liquid into the beaten eggs. Add the egg mixture to the chicken and stir gently over very low heat until the sauce has thickened-do not boil. Serve garnished with toasted sesame seeds. Serves 6 to 8. Some of my readers might suspect that I chose this recipe because I'm crazy about olives. Some of my readers might be right. Use imported Seville olives for an authentic taste of Spain, but any good quality brine-cured green olives will do fine. Heat the oil in a large pan over moderate heat and brown the chicken pieces on all sides. Add the remaining ingredients except the olives and simmer covered over low heat until the chicken is tender, about 1 hour. Add the olives and cook uncovered for 15 minutes. Serves 4 to 6. This recipe is a wonderful way to use up leftover chicken. You may also add whatever odds and ends of vegetables you have in the refrigerator, so please feel free to experiment with this one. For the sauce, melt the butter in a saucepan over moderate heat. Stir in the flour and cook 3 minutes, stirring frequently. Add the milk, chicken broth, cayenne, salt, and pepper and bring to a simmer. Cook for 5 minutes, stirring frequently. For the hash, melt the butter in a large skillet over moderate heat. Saute the onion and bell pepper until tender, about 5 minutes. Add the mushrooms, parsley, salt, and pepper and cook an additional 10 minutes. Add the potatoes, chicken, and sauce, and transfer to a buttered shallow baking dish. Bake in a preheated 400F (200C) oven for 30 to 40 minutes, until it is bubbling and the top is golden brown. Garnish with chopped chives. Serves 4 to 6. Hot chili peppers can increase your heart rate, bring beads of perspiration to your brow, and cause the release of endorphins. Sound familiar? No wonder they are considered an aphrodisiac. Whisk together the soy sauce, oil, lime juice, sugar, red pepper flakes, garlic, lime zest, salt, and pepper. Add the chicken and marinate in the refrigerator for 1 to 2 hours. Grill, broil, or saute the chicken breasts until done, about 5 minutes per side. Serve garnished with mint and cilantro. Serves 2. The secret to this dish, as with any recipe using chicken breasts, is to not overcook the meat. Cook it just until the meat is firm to the touch, and test by making a small cut in the thickest part of the meat to make sure there is no hint of pink. Whisk together the oil, lime juice, herbs, salt, and pepper and combine with the chicken breasts in a bowl or plastic bag. Marinate at room temperature for 20 to 30 minutes. Transfer the chicken to a broiler pan or baking sheet and discard the marinade. Broil under a preheated broiler just until cooked through, about 3 minutes per side. Serves 4 to 6.